One of the more useful allusions hidden in plain sight in the recent IPCC / UN report on climate crisis is the distinction between the pre-industrial and industrial ages that defines the era of climate crisis. Industrial capitalism, a/k/a capitalism, is the cause of climate crisis. Plenty of pseudo-scientific rubbish about human caused and Anthropocene can be found in the report’s text. But industry— the integration of science and technology in capitalist production, is identified as the cause. No longer are goat herders in Turkmenistan as responsible as the executives of Exxon-Mobil for the unfolding debacle. The report is striking in its urgency. Feedback loops and tipping points contradict any straight-line assurances of an orderly and knowable path forward. Behind pages of stark calculations can be found Gaia, the unknowable relations of Mother Earth that make a mockery of scientific certainty beyond the understanding that the environment of the planet is being destroyed and needs to be fixed. Missing is any semblance of a political program to move resolution forward. But also missing is the usual subtext of technocrats meeting in swank hotels to eat four-star meals, swap resumes and network. The stakes are now apparently too high. 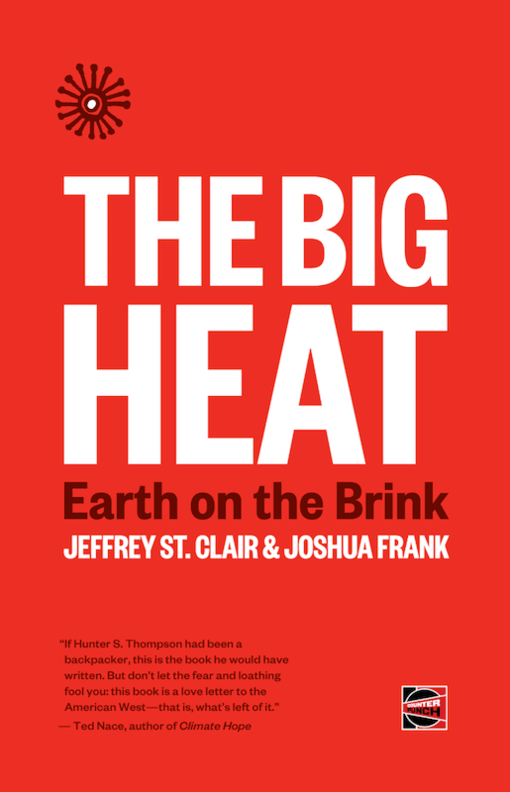 Identification of the industrial age— capitalism, as the cause of climate crisis brings with it a host of related revelations. Capitalist wealth becomes a crude measure of its reciprocal in environmental devastation. The relation of wealth to political power makes timely and / or peaceful resolution improbable. Capitalist accumulation will hereafter be a measure of informed socio-pathology. The writing is on the wall. The American political ‘choice’ between the wealthy or their technocratic servants is a formula for environmental annihilation. The system crisis is a metaphor for the political crisis that makes resolution so intractable. Graph: % of cumulative CO2 emissions 1850 – 2002 serves as a proxy for industrialization. The U.S. has far and away been the main emitter of CO2 through its role in capitalist production and through exporting the American industrial model. There are alternative measures (see link) that reduce the relative U.S. contribution to climate crisis— say through deforestation undertaken to support animal agriculture, but none that don’t tie back to it through consumption of industrial products. Source: wri.org. In what is most likely a tactical political calculation, the report presents climate crisis in isolation from oceanic dead zones, depleted fisheries, deforestation, contaminated groundwater, contaminated air and the other by-products of capitalist production. 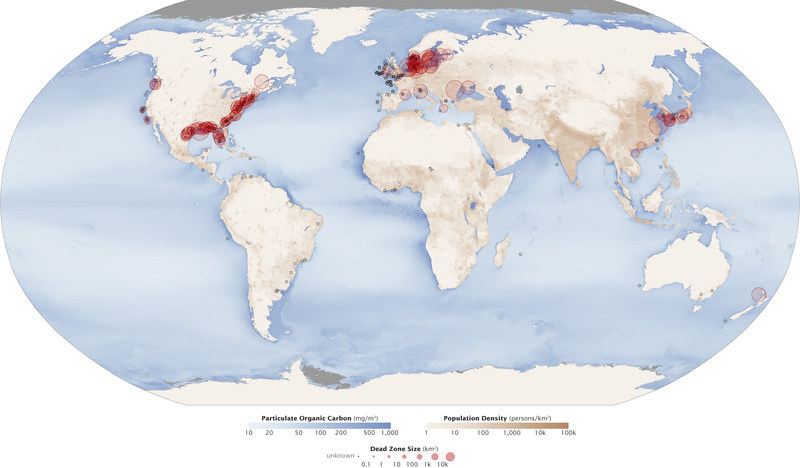 Oceanic dead zones are caused by fertilizer runoff from industrial agriculture and contamination from industry. Depleted fisheries are evidence of capitalist ‘efficiency,’ trawl-net fishing scoops up everything in its path with half or more of what is caught tossed back into the oceans dead. Deforestation is to grow crops to feed the ‘livestock’ of industrial animal agriculture. Climate crisis is thereby calculated delimitation of the environmental ills caused by the approach to the world that is capitalism. The report uses science as a method of legal circumscription, as the separation of truth from what can be proved. What can be proved are limited truths— that one degree is greater than zero degrees and that the difference correlates with destructive consequences. Left unspoken are the consequences that lack a relation between truth and meaningful circumscription. Strip-mined Pennsylvania coal-fields are to Chilean copper mines as oceanic dead zones are to chemically-poisoned agricultural lands. Science proceeds from within an intentionally closed logic. As a political strategy, it is begging at the feet of those who benefit economically from not understanding its legalisms. Graph: Oceanic dead zones, the product of runoff from industrial agriculture and industrial pollution, track American industrialization and the export of the American industrial model. The red circles surrounding industrial economies represent dead zones. Following WWII, the U.S. exported American-style capitalism to Germany and Japan through the Marshall plan. The U.S., Germany and Japan also feature prominently as cumulative emitters of CO2 since 1850 in the graph above this one. Source: nasa.gov. From within its motivating logic, capitalism is the science of economic production— its unintended consequences are separate, if indissociable, from its product. As fact and analog, GDP (Gross Domestic Product) counts goods and services produced without deducting the social and environmental harms that are indissociable from them. Practically speaking, such an accounting— like that of science, necessarily proceeds from the premise that local quanta are related to some unknown total. The analytical paradox is that without knowledge of this total, these quanta are indeterminate, ultimately an arithmetic of fools and con artists. The first industrial revolution began in and around England in the eighteenth century and was exported to the U.S. The second industrial revolution— the process of industrialization, began in the mid-late nineteenth century and took place in the U.S., England, Germany and Japan. World Wars I and II, typically explained in geopolitical terms, were imperial wars undertaken to secure industrial inputs. The Japanese attack on Pearl Harbor was in response to an American oil embargo that would have halted Japanese industrial production within a matter of weeks had it continued. Militarism is inexorably tied to environmental destruction through industry. The American motivation for rebuilding industrial capitalism following WWII with programs like the Marshall Plan wasn’t to destroy the world. It was to preclude more wars like WWII. Capitalist theory had / has it that capitalist democracy promotes prosperity and peaceful political resolution. That capitalist democracy fails as description ties in history to the assertion that ideological, rather than industrial, competition explains the World Wars. The estimation of GDP, a crude assertion of capitalist product parsed from its broader facts, serves as a metaphor for the structure of this logic. The IPCC report substantially shortens the time horizon before irreversible climate forces are unleashed to as little as twelve years. This makes it even less politically constructive to exclude the related consequences of capitalist production from potential solutions. For instance, only ‘feedback loops’ perceived to be directly related to climate change like increased solar absorption from melting ice caps and the release of methane from melting permafrost are presented. The motivation for doing so may be pragmatic— to focus energy on the most urgent problems first. But the narrowness of the focus leaves capitalist production, broadly considered, unaddressed. Phrased differently, how plausible is it that world-ending environmental catastrophe can be avoided without healthy oceans and forests? The major cause of depleted fisheries, oceanic dead zones and deforestation is animal agriculture. Consider trawl-net fishing for a moment. Trawl-net fishing is ‘efficient’ in the narrow capitalist sense of being profitable— the value of the fish caught and brought to market is greater than the cost of catching them. However, from an environmental perspective, it is utterly insane. Half or more of the fish trapped in trawl nets are killed and their corpses dumped back into the ocean. Fisheries are depleted— paradoxically raising the value of the remaining fish by reducing supply. And no value is placed on the lives of the animals that are killed and discarded. Deforestation is largely undertaken to grow feed crops for factory farm animals. Seventy percent of agricultural land worldwide is used to feed ‘livestock.’ In terms of serving human needs, far more people could be fed by ending animal agriculture and having people eat vegan diets. This isn’t proselytizing— if efficiency is the goal, vegan diets are the most efficient. But this isn’t the capitalist metric of efficiency. Profits are. Environmental destruction is profitable. Between trawl-net fishing, animal agriculture and broader environmental harms, capitalist efficiency is among the least plausible theories in human history. Prominent technocrats on the American Left regularly allude to the potentially genocidal consequences of radically reconsidering capitalism because it is so deeply integrated into complex global economic relations. For instance, any large-scale interruption in industrial food production could mean starvation for millions, or even billions, of people. As irony has it, this is also one of the potential consequences of failing to adequately address climate crisis raised in the IPCC report. Ending animal agriculture seems such a logical step toward environmental resolution in multiple dimensions that its absence illustrates the intractability of the political problem at hand. What again is so provocative about the IPCC report— itself considered overly conservative by other climate commenters, is the truncated time horizon before irreversible environmental consequences begin to unfold. The American belief that progress can be accomplished through electoral politics has always rested on deference to a perpetual tomorrow. American political economy is governed by the rich who owe their fortunes to offloading environmental harms on the rest of us. They are supported by technocrats whose profit seeking function motivates them to offload environmental harms on the rest of us. So, what’s the plan? The history with ‘alternatives’ is of carefully delimited successes, gaming and scams. Carbon taxes have been in place in Europe for decades and the result is gaming and scams. Solar cells are dirty to manufacture and toxic to dispose of. The only way they ‘work’ is through separating climate crisis from the other ills of capitalist production to which they are additive. Wind power is promising but capacity is limited. As Iand others have argued, the ‘Green New Deal’ is siloed, unlikely to resolve climate crisis and has an economic constituency that is motivated by the desire to prolong environmental resolution into perpetuity. An example of the challenge is the remarkable success of fuel efficiency standards and technologies like catalytic converters in reducing pollution from automobile exhaust. Before these were introduced in the mid-1970s, automobile exhaust was dirty and toxic. Following their introduction, illnesses and deaths from breathing car exhaust fell dramatically. In a narrow sense— with reducing the toxicity of automobile exhaust as the criteria, fuel efficiency standards were a smashing success. When considered more broadly, the impact of America’s car culture— from mining input materials to dirty manufacturing processes, disposal costs and the spread of car culture around the globe, has been environmentally catastrophic. Capitalist economic production and consumption has accumulated to impending global environmental catastrophe. The people who benefit economically also control American politics through the fortunes they’ve made as industrialists, and more recently through finance and privatized government technologies. Offloading environmental costs benefits Wall Street because it boosts profits and raises the capacity to repay its loans. Technology benefits from outsourcing dirty production because it lands on other environmental ledgers (China). Gaming national environmental restrictions is easy because multi-national corporations can choose their national affiliations. Addressing climate crisis in isolation assumes total knowledge of environmental relationships. It is a non-sequitur that the climate can be healed with dead oceans and denuded forests. These are all related. As great the need to address problems in the order of their urgency may seem, it has been this tendency to place them in technocratic silos rather than see them as the related products of the approach to the world that is capitalism, that has led those who care to the grim realization that time has run out. To the skeptics, the consequences of the eco-pessimists being wrong are microscopic compared to those of being right. Go vegan, ditch the car, turn down the thermostat and start a revolution. What you thought you had to lose by doing so just waved bye-bye.